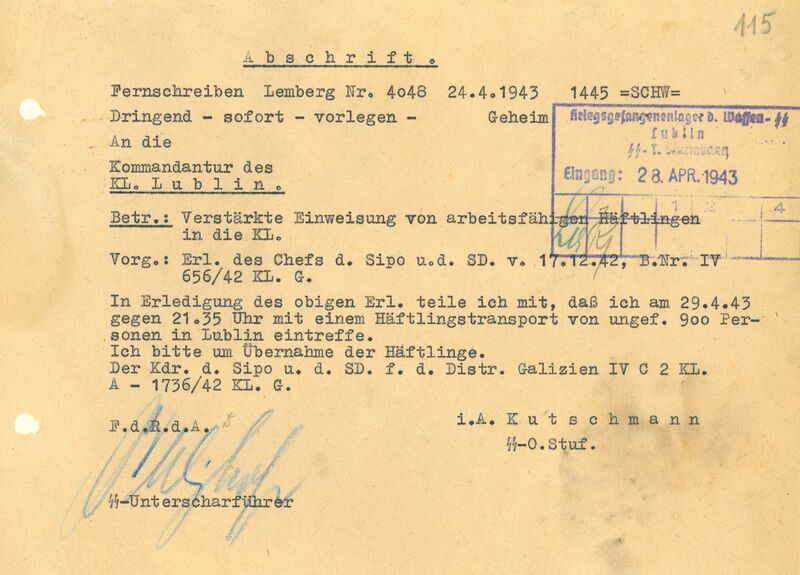 Order to direct to KL Lublin Belarussians detained as part of actions against "gangs"
Execution by firing squad of 18,000 Jews – prisoners of Majdanek and labor camps in Lublin - operation "Erntefest"
It was Heinrich Himmler, during his visit to Lublin in July 1941, who decided to establish a camp in Lublin. He ordered to build a camp for 25–50,000 Soviet POWs in the south-eastern outskirts of Lublin. The construction was commissioned to the SS Central Construction Board. Prisoners were supposed to work in the construction of a large housing estate for the SS, Clothing and Supplies Factories, and after their completion they were to be employed in production and in the workshops which were to be formed in the camp. 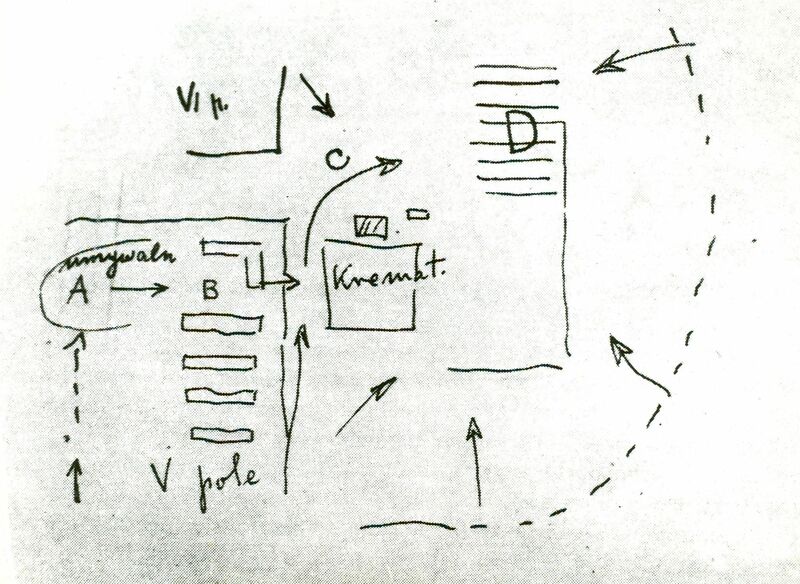 After giving the instructions for building the camp, Heinrich Himmler gave the order to an SS-Standartenführer Karl Otto Koch, who was the former commandant of the Buchenwald concentration camp, to take up organisational matters of newly emerging camp. 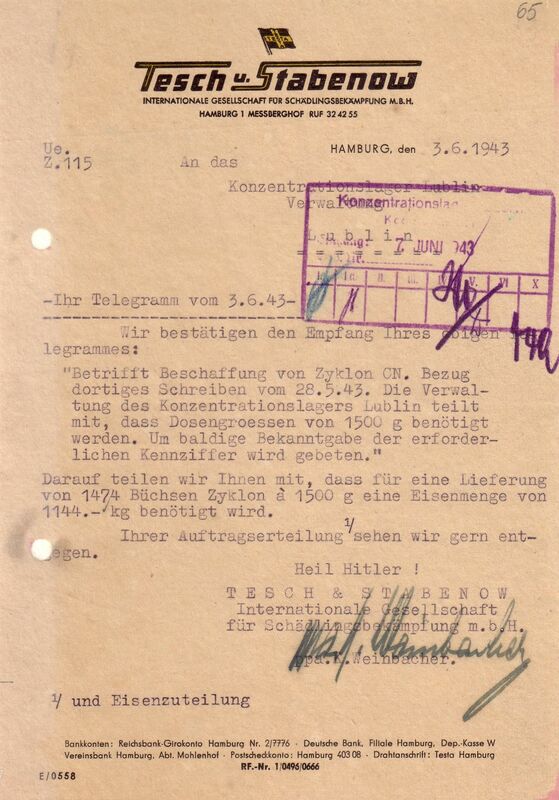 Hans Kammler's order of September 27, 1942, on immediate beginning of erecting camps for prisoners of war in Auschwitz and Lublin, constituted grounds for commencement of construction work. The first large group of prisoners were Soviet prisoners of war. 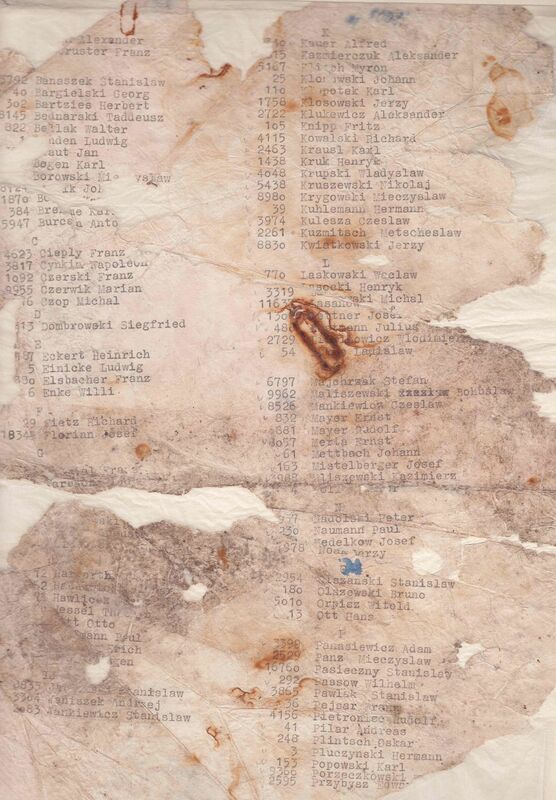 Shortly after their deportation also interpreters, physicians and prisoner functionaries from other camps started to be brought at Majdanek, including from Auschwitz, Buchenwald, Dachau and Sachsenhausen. The first group of prisoners, employed to erect the camp, constituted Jews brought to Majdanek from the Lublin ghetto. In December 1941 the first groups of Polish hostages started to be detained in the Majdanek camp. They were imprisoned in reprisal for participation in sabotage and in guerrilla actions as well as for default on quota and tax towards the occupational authorities. At the end of the month the transport of 400 peasants was sent to the camp. Those people were arrested and taken directly to the camp from villages near Lublin. At Majdanek started to be detained prisoners as part of "Aktion Reinhardt." Transports of Slovak Jews arrived to Majdanek as a result of agreement between Nazi Germany and Slovakia. They were mostly men who were able to work. Women, children and the elderly from those transports were directed to different villages and towns in Lublin district and they were settled there instead of Jews, who were sent to the death camps in Bełżec and Sobibór. In general, around 8,500 Slovak Jews and about 6,000 Jews from the Protectorate of Bohemia and Moravia as well as from Germany and Austria were detained at Majdanek in the spring of 1942. In the summer of 1942, construction of gas chambers started. In July of that year Cyclone B was ordered in Tesch & Stabenow company in Hamburg. The first batch of the poisonous gas was delivered to the camp at the end of August, whereas the gas chambers were put into operation in September or October 1942. Carbon monoxide was also used for killing prisoners. Gas chambers were set up in brick-built building called bunker, which was placed behind the bath barracks for men. It was surrounded by barbed wire and wooden fence. Above it spread the shelter supported by wooden pillars affixed to concrete pedestals. Frauen Konzentrationslager (FKL) was established on October 1, 1942. The first inmates were women from Dziesiąta and Wieniawa (quarters of Lublin) and from the town of Goraj. The concentration camp for women was set up in prisoner field V. Not only men but also women had to comply with very severe rules and were supervised by German women brought to Majdanek from the Ravensbrück concentration camp. Pursuant to Heinrich Himmler’s order, nearly 35,000 people detained in prisons were brought to Majdanek and Auschwitz. The first such transport arrived to KL Lublin on January 7, 1943. It included mainly political prisoners from Radom, Kielce, Piotrków and Częstochowa. Next, the transports from Warsaw, Lvov and other places came. Starting March 1943, the first transports of Belarussian prisoners came – including mainly women and children from the camps in Vitebsk and Mogilev. 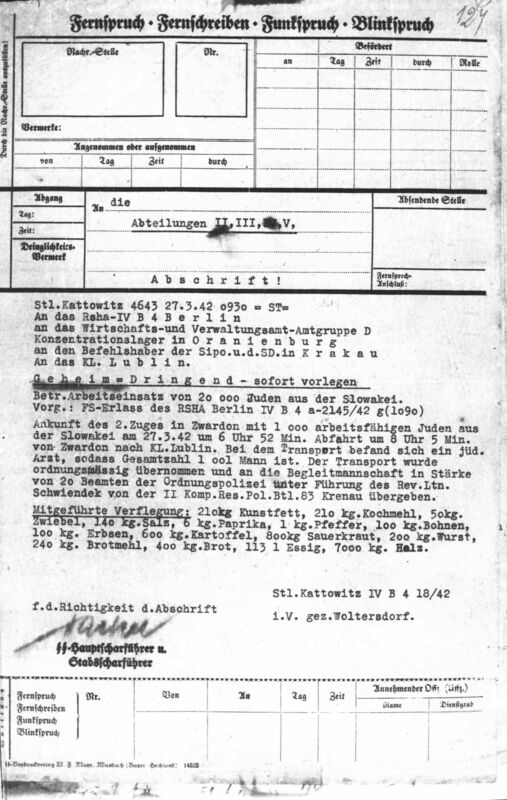 Successive transports arrived until January 1944. Field hospital was an autonomous unit of the Majdanek camp. It was earmarked for war invalids who were disabled or suffered illnesses as a result of serving at the front or those who defected to the Germans. They were marked with no numbers and wore no badges. They did not have to wear striped uniforms. The camp commandant's office set up the field hospital in field II. Physicians, interpreters, writers and cooks selected from among the prisoners, were ordered to establish the hospital, take care of the invalids and manage office and supplies. Due to illnesses from which the invalids suffered, the barracks in field II were divided into: surgical, isolation and of internal medicine, each housing 200 patients. Influx of huge transports with Jews came to Majdanek by the end of April 1943, when the uprising in the Warsaw ghetto had been almost over and its liquidation started. On April 19, an uprising broke out in the ghetto. In spite of heroic fight, SS units led by Jürgen Stroop bloodily suppressed Jewish resistance. Remaining ghetto inhabitants were deported to the camps in Treblinka, Poniatowa, Trawniki and at Majdanek. According to Stroop's report, these transports included 56,000 Jews in total. It has been estimated that about 20,000 Jews were sent at Majdanek. Based on Odilo Globocnik's order of June 3, 1943, on "combating bands," people from the following poviats were brought to Majdanek: Biłgoraj, Hrubieszów, Tomaszów Lubelski and Zamość. Pacification and dislocation action code-named "Werwolf I und II" started on June 27, 1943, and finished not earlier than by mid July. People captured in its course had been detained in transitory camps in Zamość and Zwierzyniec, and then were sent to Majdanek. The majority of newcomers were mothers with children. There were 9,000 people detained at Majdanek between June 30 and August 1, 1943, who were dislocated from the Zamość region. On November 3, 1943, the biggest execution in the history of German concentration camps took place in Majdanek camp. It was conducted within the operation “Erntefest” (Harvest Festival) and it finished extermination of the Jews in the Lublin district. The “Erntefest” operation held in Lublin involved all the Jewish prisoners of Majdanek, and those from the camps on Lipowa Street and in Flugplatz – 18,000 people in total. 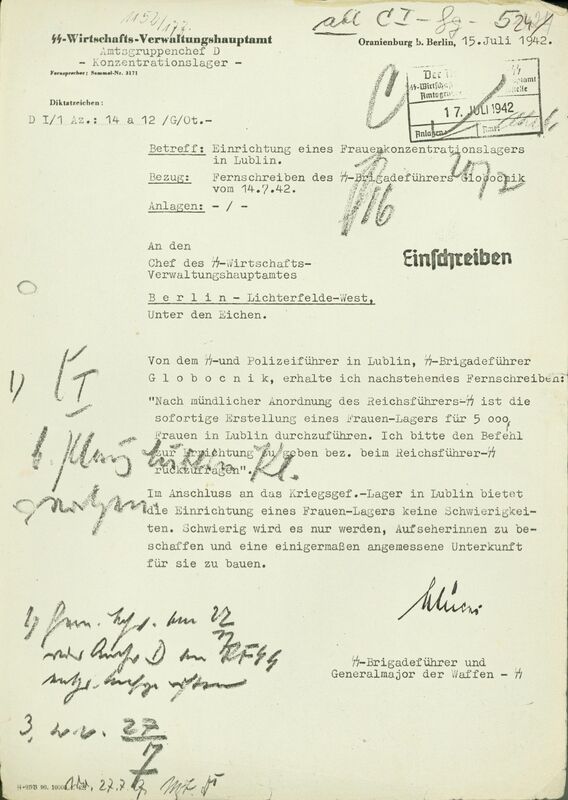 First decisions concerning the “Erntefest” operation were probably made already in the summer of 1943. The latest build-up to the operation took place a few days before its execution, at the end of October. At the back of the camp, right after field V and near a newly built crematorium, the inmates divided into groups had to dig three ditches 100 metres long and 1.5-3 metres deep. The convicts had to gather in field V. When they got there they had to get undressed. Then they were taken to the ditches where they were ordered to lie face down to the ground. They were killed by a single shot in the back of the head or neck by members of the execution commando who were standing on the edge of a ditch. For the entire time, the march and dance music was played to drown out the noise of shots. Drawing by Jerzy Szcześniewski depicting the course of action "Erntefest"
Following the extermination of Jews, the largest ethnic groups at Majdanek were Poles and citizens of the USSR. However, at the turn of 1943, the transports with ill prisoners from the camps in the Reich started arriving to KL Lublin, among them from Auschwitz, Buchenwald, Dachau, Neuengamme and Sachsenhausen. Many of the inmates died during the travel or just after their arrival at Majdanek. First evacuation transports started at the beginning of April. In less than three weeks about 9,000 men, women and children were transported to the concentration camps located west of Lublin. People who were deemed able to work got to camps in the Reich, whereas the majority of the sick and many in grave condition got to Auschwitz. Three months later, on July 7, the headquarters of the camp resumed the evacuation by sending 1250 prisoners of war to the Mauthausen concentration camp near Linz. The final liquidation of the camp took place in the afternoon on July 22. A few hours earlier, near the crematorium of Majdanek, Germans executed several hundred prisoners of the Lublin Castle and civilians in reprisal for partisan activities. The column with around 800 people escorted by the SS officers was taken out of the Majdanek. They were accompanied by more than 200 prisoners from the camp on Lipowa Street and after a few days of march they were embarked on train from Ćmielów to Auschwitz. The next morning, unattended peasants got out of Majdanek. A few hours later, during still ongoing struggles for Lublin, the troops of 1st Belorussian Front entering the territory of the camp found their Soviet comrades in arms in the camp.